One of the things you do whenever you see a snake whether its deadly or not, is to never get near it and tries to disturb it because you'll never know what it can do to you. It takes so much time to pet a snake, but this woman from Alabama don't have any idea about petting a snake. She was trying to film a snake from their garden which was said a rat snake and was talking to it while moving her phone to the snake's place. The woman now will try to touch the snake's tail, as she said, "I’m gonna touch you on the tail and see what you do," as she attempts to touch it the snake then coils up on it's defense position. As the snake spirals up and begins hissing the woman placed her camera in front of it and exclaimed, "Oh you're mean, you're a bad snake." The snake who was on its defense position quickly attacks the woman causing her to scream and drops her phone. She then still tried to get her phone and shoved the snake's head with it. 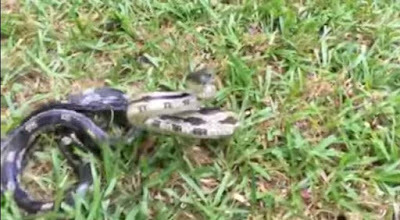 The video was cut off before seeing what happened to the woman, her phone and to the snake. The video was uploaded by username Brian Lucas and wrote the description, "Friends mom messing around with a snake in Alabama." It was uploaded last June 21 and already have 1,403,701 views.